Glebe is one of the oldest suburbs in Australia and has always been one of Australia’s working class areas that have provided men and women for the many wars that Australia has entered into for well over 100 years. The fascinating thing is that Glebe has had four public war memorials erected since European settlement but there has only ever been recognition of the First World War on all of them. The numbers of Australians who served in WW1 was about 330,000 compared to about 500,000 in other wars but the casualties suffered at 60,000 deaths is twice that of all other wars combined. Nevertheless other communities have memorials remembering the fallen from other conflicts in particular the Second World War where nearly 30,000 Australians died. The most prominent Glebe memorial is in Foley Park on Glebe Point Rd and this was refurbished by the City of Sydney in 2014. It records 174 men, most of whom lost their lives in the Great War. The largest listing of names was created in the Glebe Town Hall after the war and it lists 787 names of those who served from the local area. 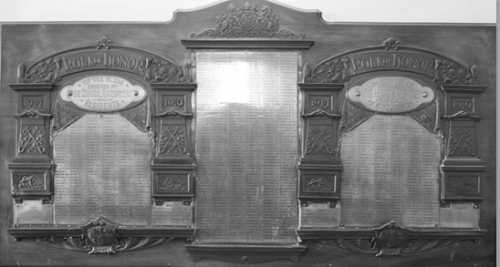 When the Town Hall was restored a few years ago the Honour Board was cleaned up and installed back to its prominent position in the main foyer. 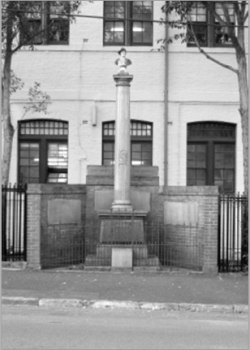 The Glebe Public School Memorial, which fronts onto Derwent St, has 303 names of those who served and formerly attended the school; this memorial has recently been refurbished with a grant provided by the State Government. The fourth Memorial is the most fascinating because it was the very first to be erected in November 1916 which makes it, along with the one in Darling St Balmain, as one of the oldest WW1 Memorials in Australia. 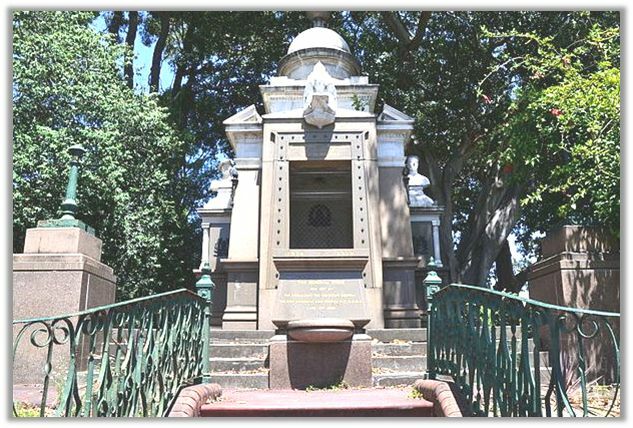 The Memorial was erected prominently within the gardens of the Rozelle Tram Depot which was located in Glebe adjacent to the Harold Park Trotting Track. 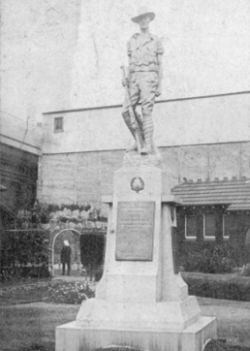 When it was decided to replace the trams with buses and close down the system, the memorial was moved and re-erected within the STA Bus Depot at Leichhardt. There are 34 names of former Tram Depot employees listed on the memorial and when it was dedicated it included four who died at Gallipoli, one of them on Anzac Day 1915. A recent meeting was held which included representatives of the STA, RSL and Glebe Society and was hosted by the CEO of The City of Sydney. The City graciously agreed to refurbish and relocate the Rozelle Tram Sheds Memorial to its original site within the development at Harold Park. The City recognised the heritage significance and above all the public recognition of those young men who lost their lives for their country. It is hoped that the memorial can be re-dedicated in November this year, exactly 100 years since its original dedication.